Donald Trump, then the Republican presidential nominee, participates in a campaign rally with Omarosa Manigault in Charlotte, N.C., in October 2016. 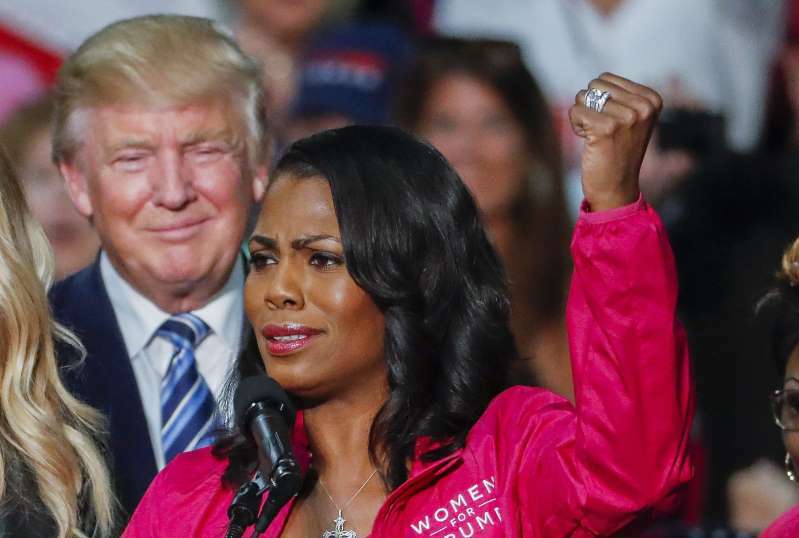 Omarosa Manigault Newman, the fired White House aide seeking publicity for her new memoir about her time in the Trump administration, said in an interview Sunday that the way Chief of Staff John F. Kelly dismissed her involved a “threat” and shared an audio recording of Kelly she said she made in the Situation Room. The recording was played on NBC News’s “Meet the Press,” where Manigault Newman was interviewed by Chuck Todd. The Washington Post reported Friday that after being fired, Manigault Newman declined a $15,000-a-month job offer with President Trump’s campaign, which came with a “companion agreement” including nondisclosure and nondisparagement provisions. Copies of both documents were obtained by The Post. The “companion agreement” states that she could not make disparaging comments about “the campaign, Mr. Trump, [Vice President] Mr. Pence, any Trump or Pence Company, any Trump or Pence Family Member, or any Trump or Pence Family Member Company or any asset any of the forgoing own.” Another provision states that the agreement would survive even if Manigault Newman’s contract expired, was canceled or she was fired. Manigault Newman, who starred on Trump’s show “The Apprentice,” was fired from her administration position in December amid allegations of misconduct, including trying to stage her wedding photos on White House grounds. Her purported recordings inside the White House — especially the Situation Room, which is supposed to be one of the most secure locations on Earth — represent a serious breach of security, said Ned Price, who was a National Security Council spokesman for the Obama administration. Price said cellphones and ­recording devices are not allowed in the room, although his experience was that aides are not screened before entering. “It’s a system based on honor and integrity, and there’s a sign outside that says, ‘Place your phones here,’ ” he said. On Sunday, Manigault Newman did not address those issues. She repeated what she asserts in the book: that Trump is a “racist, misogynist and bigot,” a realization that she said dawned on her only as her rocky White House tenure came to an end. Todd asked why she did not come to this conclusion sooner, noting that Trump had said many things over the years that people considered racist, including calling Mexicans “rapists” or saying “both sides” were to blame for bloodshed during the white nationalist march in Charlottesville last year. Trump launched his political career advancing the birther conspiracy about President Barack Obama. White House aides are exploring what punishment she could face for the purported recordings in the Situation Room and in the building, according to a senior administration official. Privately, many are wondering how many tapes she might have — and whether they are heard speaking on them. Manigault has tapes of Trump speaking, a person familiar with the tapes said.